The following press release was received from Pegram Racing (Manager of the Team Hero EBR WSB effort) this morning. 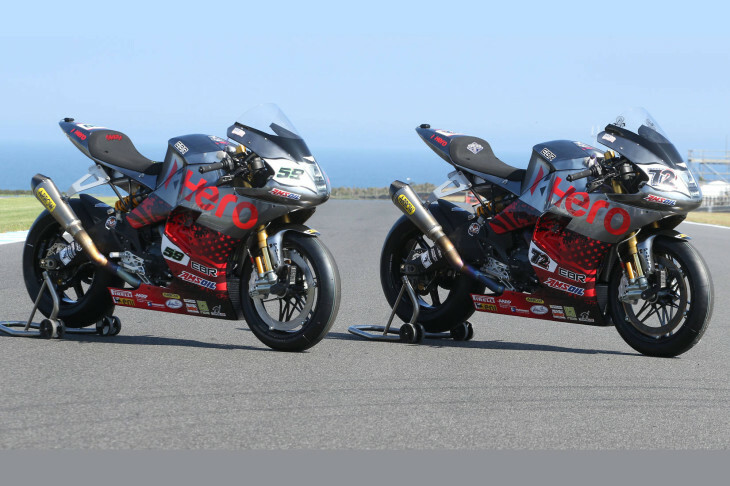 Despite an assurance to the media and fans just a couple of weeks ago that Team Hero EBR would continue to compete through the remainder of the 2015 WSB championship series despite the bankruptcy of Erik Buell Racing, Pegram announced today that the team has discontinued its efforts … for now. I get the whole American made bike thing, but Buell bikes sucked when the business was up and running as well as the EBR race bikes. And even when DMG took over AMA road racing and let a 1200cc twin race with inline 600’s they still barely won a title in American road racing, one I feel was completely unfair and maybe just done to get “American made” back at the top. Erick Buell reminds me of a punch drunk boxer that doesn’t know that his skills have diminished and it was time to give up after the last title was won…Roy Jones Jr. syndrome! So why was my comment deleted??? It does matter to some of us here and it should after all this is the U.S.A. right! and all the nay sayer’s haven’t got a clue , What E.B.R. accomplished in such a short time on limited funding is absolutely amazing if you have not rode one of there bike’s YOU have no clue what you are talking about. Yawn…And this actually matters to anyone here exactly how? Full of sound and fury, signifying nothing (apology to William). NOBODY believed that they would continue racing just for the fun of it. Racing = Big Bucks and in this cars there is no ROI. It’s sad… I mean, the bikes finally look good and the product a real choice for those looking at other bikes without excuse and now this. Of course, why race without a business, but I was hoping they might come to Moto American and at least use them here with some support… Wishes / Dreams and just too bad. Don’t think they were going to get competitive with those 4 cylinders… but in MotoAmerica, they could have. Well-noted… Great minds don’t always mean good business, but good business may have never went racing and then we would have a good discussion. Not surprising, it hasn’t been a successful year for them. The bottom 5 is where they’ve been every race, and sponsors aren’t going to want to spoon out money for that, especially with the manufacturer out of business. There’s the worlds biggest surprise. If you are consistently a back marker, and the manufacturer just went t*ts up, why would you keep racing (as a business, I know why you’d want to keep racing in general)? Erik deserved better. Twice. #2 JR Racing BMW, called that too. #3 Hero/EBR, not even Erik seen this one coming. Good number of racists here on MD. Where are the yank backers, then? H-D? That’s a bit harsh- they set pole once didn’t they? I just checked and don’t even see that they made Superpole 2 even once. They sit in last and 3rd to last in the standings. Imagine that!!?? Hero is acting like a bunch of Indian businessmen! Buell’s biggest mistake was trusting ’em! or possibly not being very good at racing?? Hey, at least the EBR guys got another year or so of paychecks, thanks to Hero. “Hero is re-directing it investment strategy, to include more 7-11 stores and roadside motels”. -Press release not quite yet released. What make’s it racist to you? If you like me have been across country you can see for yourself how many 7-Elevens and independent motels have east Indians running them. It’s just a coincidence. Nothing more. Unless you’re a race baiter. I got it. Eric designs and builds incredible bikes but is not a business man..
Hard to run a business when your investor doesn’t come through with the money they promised to invest.. Hero back out, eh? So, they turned out to be Indian givers. Get it? Methinks Elon Musk would be considerably less brilliant if there were no government subsidies. Anybody can be brilliant with other peoples money. I dont think you quite understand who Elon Musk is..